After 6 months training for a 10k I posted a faster time than I now do 12 months after. My training program is consistently 2 x 5k and 1 x 10k per week at tempo pace. Why am I slower now than I was a year ago and then with only 6 months training? Thanks for your intriguing question about your 10k running time. A worse result when you feel you are better trained can have so many different reasons though. Form of the day, tiredness, the course itself, going out too fast and blowing up mid-way etc, it can all contribute to not being your best on the day. I remember a time when I was so well trained but just completely overestimated my abilities. The course was 4 x 2.5k. The first 2.5k went great, the 2nd okay and during the 3rd and 4th I got passed left, right and center! Very painful! So, analyze what could be some of the reasons that contributed to your race result. Secondly, I'd be curious to know for how long you have been doing this same running routine. The running training you are doing is great to set a good level of fitness. But if you do the same thing week in, week out, after a while there is not much training stimulus anymore and you will not improve that much. Running a variety of running speeds, i.e. some easy/slow runs, some tempo running and some interval running. 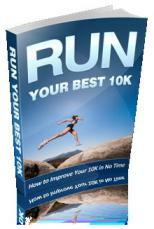 Making your long run longer than 10k. Imagine if you'd be able to comfortably cover 14k, 16k or even 20k. You'd become a lot faster over the shorter distances, I can tell you that! Check out my running training section for further information. Plenty of ideas there for different workouts you can do!